I saw this tin can in one of the small boxes that line up the aisle on the way to the counter at Sephora (Singapore). When I picked it up and examined it, it seemed to say “Buy me!”. I did just that. I was initially attracted to the vintage inspired design of the tin can. The first thing that captured me when I opened the tin can was the distinct scent of rose and mint. At first glance, the red color of the balm looked quite captivating, but I was a bit taken aback on how greasy it first appeared. I flipped the tin can over and read the ingredients. Petrolatum was one of the key ingredients. The consistency of Smith’s Minted Rose Lip Balm by Rosebud Perfume Co. is softer than I would prefer my lip balms to be. When I initially swirled my fingers on the balm, I made a “pot hole”. I made a mental note, softer swirling next time; so as not to create new “pot holes” and not to pick up an excessive amount of product. When I applied the product on my lips, I could feel the immediate effects of peppermint oil. It takes a few minutes for it to fully enhance my pout and the sting isn’t as noticeable as some of those lip enhancers that have chilli in them. This is gentle enough for one of the thinnest skin areas of the face. The gloss from Peppermint oil and Cotton Seed oil also helps in making my lips look fuller by catching the light. Since petrolatum is one of its main ingredients, it’s quite slippery; especially upon initial contact with the heat from your fingers. Petrolatum has a lower melting point than that of Beeswax. Speaking of melting point, one thing that I have noticed about this product is that when it gets too hot, it melts. I’ve noticed this every time I work on location. You leave it at an angle for a specific period of time and the balm shifts to the angle of the tin can. One time, I was so surprised when I opened the tin can after retrieving it from the front pocket of my belt bag. You see, the tin can stood in a vertical position inside my belt bag; because of the heat from the sun and the lights, the balm changed its orientation and sank into the new “bottom” of the tin can. When I opened the can and laid it on the table, I gasped. Think half moon. One side of the tin can was empty and the other was full of lip balm. I had to heat the tin can with my hair dryer so that the lip balm shift back to it’s original position. 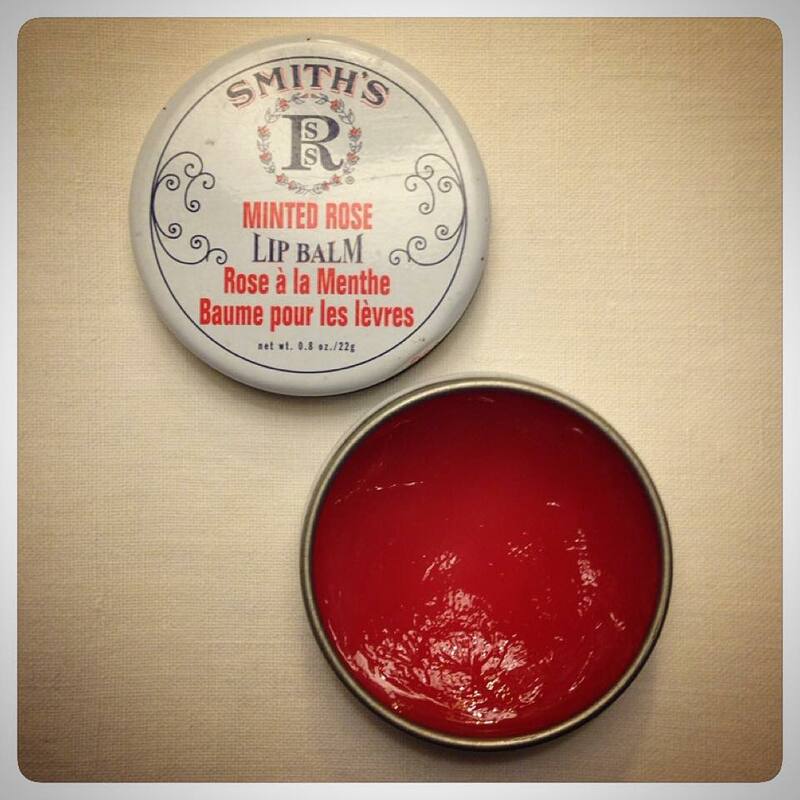 Now, I only use Smith’s Minted Rose Lip Balm by Rosebud Perfume Co. when I am working in a studio. I have used this for work numerous times. After the skin prep process, I apply a generous amount of Smith’s Minted Rose Lip Balm by Rosebud Perfume Co. on the lips of the person I am working with. This is to act as a moisturizing agent and as protective layer. If ever foundation or concealer makes it way to the lip area, it would be easy to wipe it off. Often when I create the “no makeup” makeup look, I line the lips with lip liner and apply Smith’s Minted Rose Lip Balm by Rosebud Perfume Co. The color of the balm adds a hint of rose to the lips. One of the things I appreciate about this product is that it doesn’t leave any after taste in the mouth. That’s one of the reason why I am not so fond of Burt’s Bees Beeswax Lip Balm. The Peppermint flavor leaves a fresh feeling in general. Upon doing some research about this product, I found out that most of their customers use the product for massages! As stated in their web page (click here), “Dab a bit on you temples to help relieve headaches and tension”. On Sephora.com, one of it’s suggested usage is to “pat on dry lips, elbows, or knees to condition whenever needed”. This is quite a multipurpose product. Smith’s Minted Rose Lip Balm by Rosebud Perfume Co. retails for $7 as listed on Sephora.com . I purchased mine at Sephora Ion in Singapore and I have seen this is Sephora Siam Center in Bangkok. I have yet to find out where I can get this here in the Philippines.